Astri is a young Norwegian girl desperate to join her father in America. After being separated from her sister and sold to a cruel goat farmer, Astri makes a daring escape. She quickly retrieves her little sister, and, armed with a troll treasure, a book of spells and curses, and a possibly magic hairbrush, they set off for America. 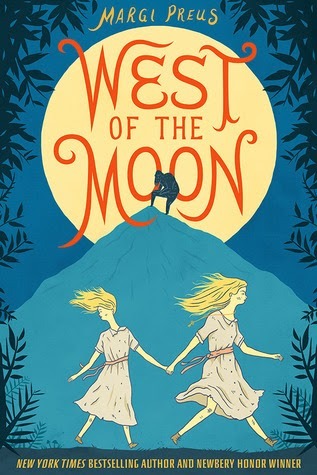 With a mysterious companion in tow and the malevolent “goatman” in pursuit, the girls head over the Norwegian mountains, through field and forest, and in and out of folktales and dreams as they steadily make their way east of the sun and west of the moon. Margi Preus is a children’s book author and playwright. Her first novel for young people, Heart of a Samurai, is a 2011 Newbery Honor Book, an ALSC Notable Book and a recipient of the Asian Pacific American Award for Children’s Literature, among other honors. Her picture books include Celebritrees; Historic and Famous Trees of the World, winner of the 2013 Flicker Tale Award. 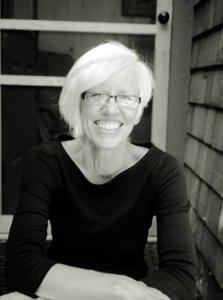 Margi served as the artistic director of Colder by the Lake Comedy Theatre for 25 years and with current Colder director and playwriting collaborator, Jean Sramek, has written hundreds of comedy sketches, a couple of comic operas, and dozens of plays for young people and grown ups. When she isn’t writing, she likes to ski, hike, paddle or sit quietly with a book in her lap. Do I sense a Newbery Award? I think so. Margi Preus has brought an exceptional piece of literature to the table in her new novel, West of the Moon. Norwegian sisters Astri and Greta are separated when Astri is sold to the local goat herder, Svaalberd. Their mother is passed and their father has made his getaway to America with the others caught in "America Fever." The idea is that he'd make a better living for his family and send for them when the time was right. Astri decides she can no longer settle for less than reuniting with their father, so she makes her escape, taking her sister and a mysterious quiet girl with her. After the initial track through a large forest while being chased by Svaalberd, they finally arrive at the ship headed to America. This is where the story shifts and proceeds with a new tone. To top off the adventure, Preus coalesces folklore and inspiration from her own ancestry to devise a Newbery-worthy novel. This book reminded me a lot of the old American girl books, especially my personal favorite, Kirsten. The journey you take with the characters isn't just interesting, but it can also open up the opportunity to learn about immigration; illnesses and illegal passengers included. I found this book in the Young Adult section at Barnes & Noble and immediately fell in love with the cover (I wish I could say I don't judge a book by its cover, but I'm a sucker for beautiful artwork!). I decided to go on a whim and purchase it, and I couldn't set it down until I was finished! I love those kinds of books. It was strange that I found it in the Young Adult books, because this is much more of a middle-grade book. I understand that there is one part where there's an implication of an adult theme, but it was very brief and if I were a kid, I probably wouldn't have caught it. Others have said they found it in the Children's section, so I guess different stores are categorizing it differently. It could go both ways, but it definitely looked out of place between all the books on vampires and teenage love-triangles. I can't wait for next year's awards, and I really hope this book either wins, or gets really close. It has all the makings of a Newbery, and it would make a wonderful embellishment of literature on anyone's bookshelf. I am so glad I randomly bought this (and judged this book by its cover)!